The 17th and 18th centuries in Western society were dominated by fears of pirates. Prowling the high seas in search of ships to plunder, pirates were rumored to have buried chests full of gold and silver bars and coins throughout the Caribbean Sea. 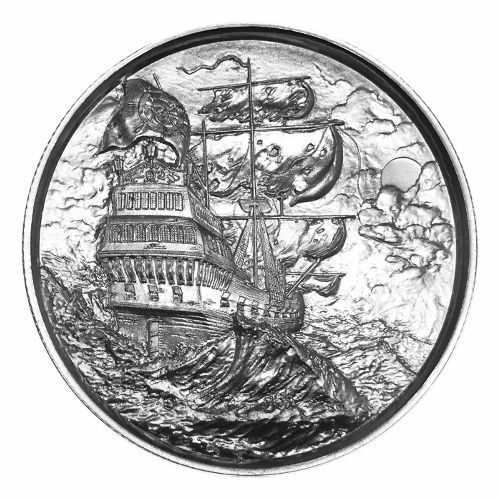 Today, Silver.com offers the new 2 oz Privateer Silver Ultra-High Relief Rounds. Consists of 2 ounces of .999 fine silver. Bears no face value as a silver round. Features a stunning ultra-high relief finish. Coins ship in flip sleeves (individual) or plastic tubes (multiples of 10). Privateers were often confused with pirates. Although the goal of both parties was to plunder enemy vessels in search of treasure, their commission was quite different. Pirates committed criminal actions by robbing other vessels of gold, silver, and other precious metals or valuables. Privateers were given commissions by governments to plunder enemy vessels only during a time of war. On the reverse face of these 2 oz Privateer Silver Ultra-High Relief Rounds is the image of privateer’s vessel rocking in choppy seas. As the flag stands stiff in the breeze and the sails flutter, the moon starts to break through the clouds. 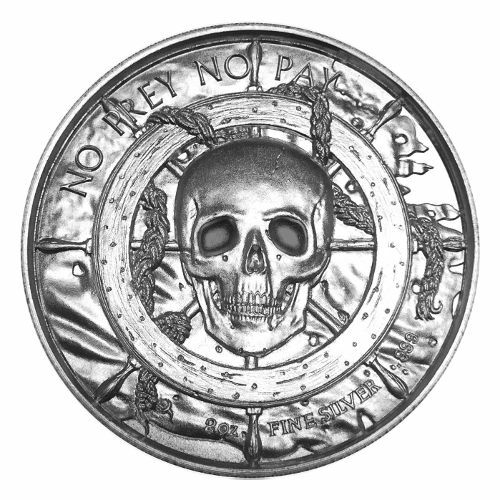 The obverse side of the coin bears iconic pirate images, along with the privateer’s motto. In the middle, a human skull is set against the wheel of a ship’s helm with a rope twisting around it. Above the image, the motto “NO PREY NO PAY” is featured. The motto meant that if the privateer’s men failed to plunder another ship successfully, no one would be paid. Each of these silver rounds is struck using a special proof coining process. Ultra-high relief coins and rounds are struck multiple times to give them a strong contrast between its design fields and the background. The images included seem to jump off the round’s surface as a result. Elemetal Mint is responsible for production of these rounds, and the entity is the result of collaboration between three private, American mints. Ohio Precious Metals, NTR Metals, and Provident Metals combined their expertise and state-of-the-art facilities to produce these rounds. If you have questions about the products in this listing, please contact a Silver.com associate at 888-989-7223, or chat with us online. We’re also available via email. If you are interested in other silver rounds available at Silver.com, check out the Silver Rounds section of the website. The first reaction you’ll probably have when you see one of these two ounce rounds is “Wow, that’s a HUGE hunk of silver! Then you’ll notice the incredible 3D depth the stamping process was able to manage because the coin is THICK. If you want to impress people with a gorgeous silver coin, forget your 100 year old silver dollar and buy one of these. It’s the most detailed coin I’ve ever owned. The only improvement I’d suggest is to slightly change the stamp on the front to read “2 oz .999 fine silver,” since it currently just says “2 oz fine silver,” so it’s not obvious for those unfamiliar with the coin that it’s as pure silver as any other coin. I’d also REALLY like to know what Air-tite or other hard plastic container will fit this thing, since it’s twice as thick as a normal silver round, and I want to protect it. The plastic flip sleeve isn’t enough for this beauty, even if I slip it inside a display book. Buy one for yourself, and more if you’d like to give them as gifts. Kids will think they’re really cool, but I’m sure they’ll also find a way to ruin the precise detail by carrying it their pockets to show all their friends. Of course their friends will immediately want one too , so you might find a lucrative market selling them yourself!